Take my advice – do NOT reinvent the wheel when it comes to WordPress theme development. If you’re someone who is just getting started with WordPress theme development you’ll make your life a LOT easier if you start with a really simple barebones WordPress theme that you can then layer on top your own html/css. You may be tempted to start diving into WordPress Theme frameworks from day 1 but I wouldn’t recommend that. Like any good framework, you can only fully appreciate the benefits of the framework once you’ve fully understood the lower layers of theme design and development first. The following is a list of some super starter themes that will get you up to speed real quick. 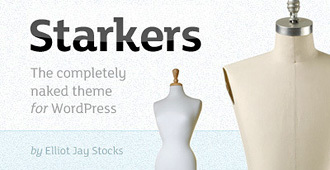 Starkers is the grandaddy of WordPress starter themes and is the brainchild of one of the best web designers around – Elliot Jay Stocks. I’ve used Starkers on many projects and cut my teeth in WordPress theme design with this bad boy. You won’t go wrong starting with Starkers. What I love about Whiteboard is that it also incorporates other frameworks like the SenCSS framework and is also soon to adopt Less Framework which I’m very excited about as Less Framework is a very interesting approach to managing the plethora of screen resolutions we now use everyday. Ok ok at the start of this post I said don’t start with a theme framework and now I’m recommending a child theme of one of the best theme frameworks – I know! Well, I would say it might be a good idea to play with either Starkers or Whiteboard before moving on to Skeleton. I love Skeleton and the Hybrid theme framework in general. 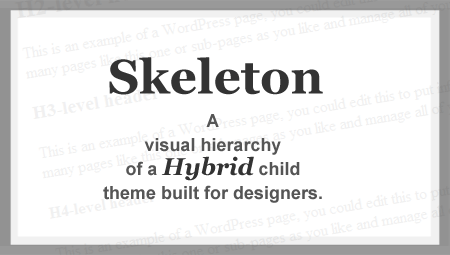 Hybrid is one of the stronger WordPress theme frameworks so Skeleton will serve as a gentle introduction to child theme development. You’ll find lots more out there for sure but stick to these 3 and you won’t go wrong! See you tomorrow gang for another advent tip!